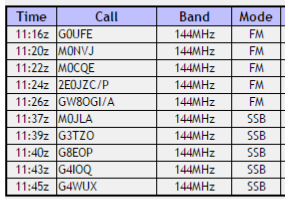 M0PLA/P SOTA Activations: 4th February 2017. Foel Fenlli SOTA Activation visit. 4th February 2017. Foel Fenlli SOTA Activation visit. GW/NW-051 Foel Fenlli. 4th February 2017. This weekends SOTA activation took us to North Wales. Foel Fenlli & Moel Famau and my first attempt with 2M SSB, having built a 2M Moxon this week and so far so good. We arrived at grid SJ 161605 and parked the car with around another 30 cars, (very busy). The first hill Foel Fenlli was our first ascent, this took as up the green route on my map and was completed in around 30 minutes. The descent took only 7 minutes down the blue route (ascent this way for the very fit). We arrived at the summit and set up, first activation was on 2M FM with G0UFE Simon a fellow TDARS Club member, then 3 more one after another. Then I decided to try out the Moxon on SSB, I spoke with M0JLA (Rod) A fellow SOTA Activator down in Hereford. As seen on the analyser the SWR for the Moxon was not too bad. Jamie reached the summit just before I did and claimed it for himself, a quick look down towards the car park below just before we made the summit saw that it was getting very full.